Two divers happen upon cargo of a sunken merchant ship in Caesarea, revealing pristine 1,600-year-old treasures and coins. 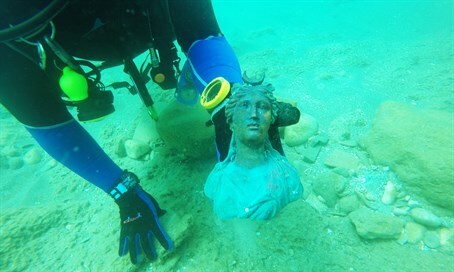 Two divers found an ancient treasure lurking in the harbor at Caesarea National Park, and after they informed the Israel Antiquities Authority (IAA) they returned with archaeologists to dive down and recover the ancient statues and coins from the depths. The find, which is the largest assemblage of marine artifacts to be recovered in the last thirty years, was made by divers Ran Feinstein and Ofer Ra'anan of Ra'anana. They will be awarded a certificate of appreciation and a tour of the storerooms of the national treasures for reporting the discovery. Feinstein and Ra'anan went diving in the ancient port of Caesarea before Passover, where they found the ancient marine cargo of a merchant ship that sank during the Late Roman period 1,600 years ago. The two immediately contacted IAA and reported what they had found. IAA archaeologists joined them as they returned to the underwater site, where the ship's iron anchors and remains of its wooden anchors could be seen. In recent weeks a salvage using advanced equipment helped unearth numerous precious items that were in the ancient ship's cargo. The artifacts, which were in an extraordinary state of preservation, included a bronze lamp depicting the image of the Roman sun god Sol, a figurine of the moon goddess Luna, a lamp in the image of the head of an African slave, fragments of three life-size bronze cast statues, objects fashioned in the shape of animals such as a whale, a bronze faucet in the form of a wild boar with a swan on its head, and more. The archaeologists also found fragments of large jars that were used for carrying drinking water for the crew in the ship and for transportation at sea. A highly unique find was also discovered among the items - two metallic lumps composed of thousands of coins weighing around 20 kilograms (over 44 pounds). The lumps of coins were in the shape of the pottery vessels they were transported in. The coins bear the image of emperor Constantine who ruled the Western Roman Empire (312-324 CE), and was later termed Constantine the Great, ruler of the Roman Empire (324-337 CE). Other coins feature the likeness of Licinius, an emperor who ruled the eastern part of the Roman Empire and was Constantine's rival until he fell in a battle between the two Roman rulers. The discovery comes just a year after a treasure of gold Fatimid coins was unearthed by divers and the IAA. The coins are currently on display to the public at the "Time Travel" presentations in Caesarea harbor. Jacob Sharvit, director of IAA's Marine Archaeology Unit, and Dror Planer, the unit's deputy director, spoke about the significance of the find. "These are extremely exciting finds, which apart from their extraordinary beauty, are of historical significance. The location and distribution of the ancient finds on the seabed indicate that a large merchant ship was carrying a cargo of metal slated recycling, which apparently encountered a storm at the entrance to the harbor and drifted until it smashed into the seawall and the rocks," said the two. They noted that a study of the iron anchors indicates the sailors tried to stop the ship from crashing by casting anchors into the sea, but the anchors broke, providing "evidence of the power of the waves and the wind which the ship was caught up in." Sharvit and Planer emphasized that "a marine assemblage such as this has not been found in Israel in the past thirty years. Metal statues are rare archaeological finds because they were always melted down and recycled in antiquity. When we find bronze artifacts it usually occurs at sea. Because these statues were wrecked together with the ship, they sank in the water and were thus ‘saved’ from the recycling process." "In the many marine excavations that have been carried out in Caesarea only very small number of bronze statues have been found, whereas in the current cargo a wealth of spectacular statues were found that were in the city and were removed from it by way of sea. The sand protected the statues; consequently they are in an amazing state of preservation – as though they were cast yesterday rather than 1,600 years ago." The archaeologists note that the find comes as part of an uptick in discoveries at Caesarea's ancient harbor in recent years. "These finds are the result of two major factors: a lack of sand on the seabed causing the exposure of ancient artifacts, and an increase in the number of divers at the site. In this particular instance, the divers demonstrated good citizenship and are deserving of praise. They will be awarded a certificate of appreciation and invited to tour the storerooms of the National Treasures." "By reporting the discovery of the marine assemblage to the Israel Antiquities Authority they have made it possible for all of us to enjoy these spectacular remains from antiquity. The public should be aware that it must report any artifacts it finds immediately to the Marine Archaeology Unit of the Israel Antiquities Authority in order to maximize our archaeological knowledge about the site," they concluded. The find was made possible largely due to the maintenance and development of the Caesarea National Park and the harbor, which the Rothschild Caesarea Foundation is funding to the tune of tens of millions of shekels. IAA continues working with the Rothschild Caesarea Foundation on major projects around the harbor. Caesarea Development Corporation director-general Michael Kersenti noted that the new discoveries highlight the historical importance of the ancient port city which continues to surprise with new finds. "The goal is to present as many of these cultural treasures as possible, which will be discovered in the future, to the numerous visitors who come to Caesarea each year," he said.